Daniel Martinez is an exceptional guitar stylist who teaches and performs from his home base in Lincoln, Nebraska. 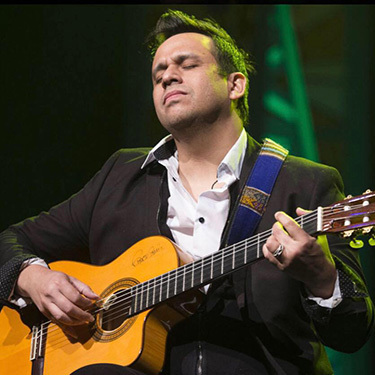 He plays all musical styles on acoustic guitar, but his specialties are Latin rhythms such as Flamenco and Rumba. Daniel teaches guitar students of all ages and abilities. Lecture/demos are designed to suit the time and the interest/age of the audience. Topics include South American music styles, Latin dance styles and The Real Jungle Book: Growing Up in the Peruvian Amazon. Daniel is available as a solo or with the four-piece band Jarana. Technical Requirements: The sound system needed is dependent upon the size and type of venue, expected attendance, etc. Basic sound requirements for Daniel are one SM58 microphone, one boom mic stand, a stool and the availability of two lines into an amplified sound system. Daniel can provide a compact sound system for smaller venues and would only require a mic stand, stool and electrical outlet. Adequate lighting and an elevated platform allowing Daniel to be seen well are ideal. Specific details are confirmed on a case by case basis. Availability: No performance scheduled on the same day if travel involves more than 350 miles or five hours drive time.